If you have been searching for something that's profitable, innovative and rewards you in return with smiles of customers and credit to the framing of irreplaceable memories, then we at Impressions forever can be the answer to your quest. 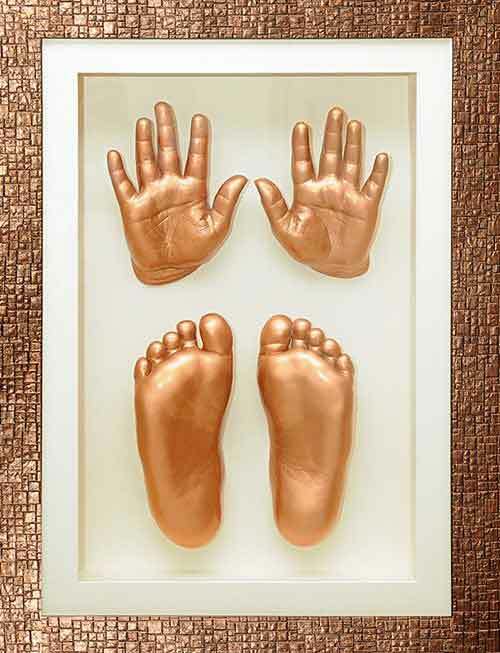 We cast impressions of hands and feet in metal finishes like gold, silver & bronze and frame them to make memorable keepsakes of a lifetime. Ranging from impressions of hands & feet of babies, parents, saints, siblings, couples or even stalwarts of honourable fraternities, we do it all for we understand the value of gifting everlasting memories / keepsakes to someone. We have successfully spread our wings to 5 states within India and with more empowered, creative, motivated & zealous women as entrepreneurs and our franchisees, we aim to go Pan India and cover every home possible. A Confident, independent entrepreneur with ability to work at my own time is what I feel as a franchise of Impressions Forever. I am grateful to Impressions Forever team for the training and the continued support. I always wanted to start a creative venture. Impressions Forever gave me that opportunity through their franchise model. I feel satisfied and cherish every unique impression that I create.